Water-repellent finish and maintenance coat for Classic. 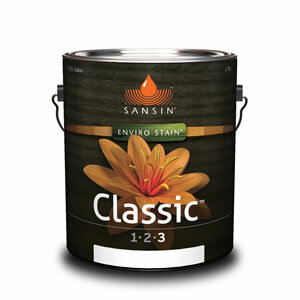 Sansin Classic Naturals Topcoat is a water-repellent top-coat formula designed as the final step of the Classic application system. May also be applied as a maintenance coat to existing Classic coatings to help ensure a water repellence on surfaces subject to more severe wetting. Classic Topcoat delivers excellent water beading, is resistant to wear, and enhances the natural UV protection – and beauty – of your Sansin Classic finish. When applying as a maintenance coat, dilute Classic Top Coat with the Sansin Classic color of your choice before application. Consult a dealer or a Sansin customer service professional for details. View the Classic Naturals Topcoat Product Data Sheet (PDF) for information about application, preparation, maintenance, and more. View the Sansin Classic Top Coat Safety Data Sheet (PDF).